My son inlaw loves his cigar and I purchased this humidor for him. It’s easy to use and looks elegant by the cigar corner. The wood wood has remarkable markings and it’s an elegant humidor for beginners. 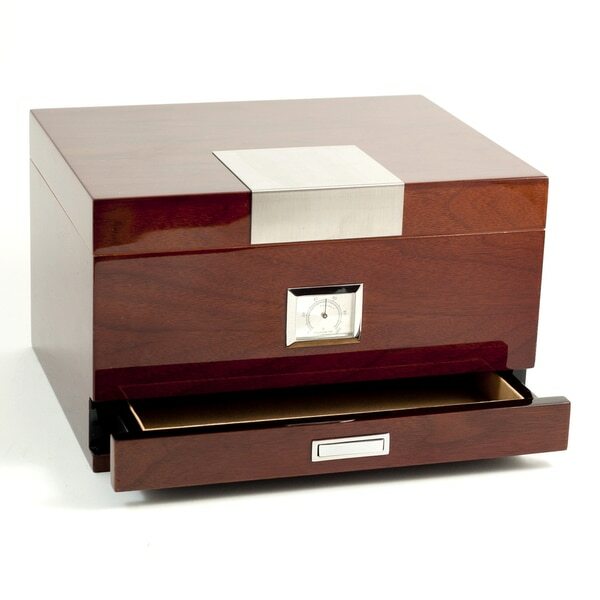 "High Lacquered ""Walnut"" Wood 60 Cigar Humidor with Spanish Cedar Lining and Accessory Drawer. Includes Humistat and External Hygrometer. Dad is big on cigars and very particular with his humidors. He loved the quality, size and that it has an accessory drawer down below for his cutter / matches, etc.. I even had the top plate engraved with his initials.. came out beautiful. couldn't be happier. My husband enjoys a cigar on Saturday nights and used to keep them in his drawer. For his birthday, I thought I would surprise him with his own personal humidor. This Humidor is beautiful! The deep walnut color, and high gloss finish looks perfect. He was very surprised and very happy with the gift. He now keeps his cigars in the perfect place to keep them fresh! I recently bough this for my husband as a Christmas present and he loved it. His words when he opened it were "this is not just a humidor but, a nice display box for them". The word seems to be of great quality and it's crafted in beautiful way. My only regret is not taking it to get his initials engraved on it on the top metal plate like I wanted to as that would have made his gift even more perfect and personal. Bought this humidor for my hubby for Father’s Day last year. It’s a quality humidor and the outside gauge seems to be fairly accurate. It’s the perfect size and has a drawer to hold lighters and cutters. Beautiful contemporary elegance!The features are functional and keeps cigars at the right humidity.